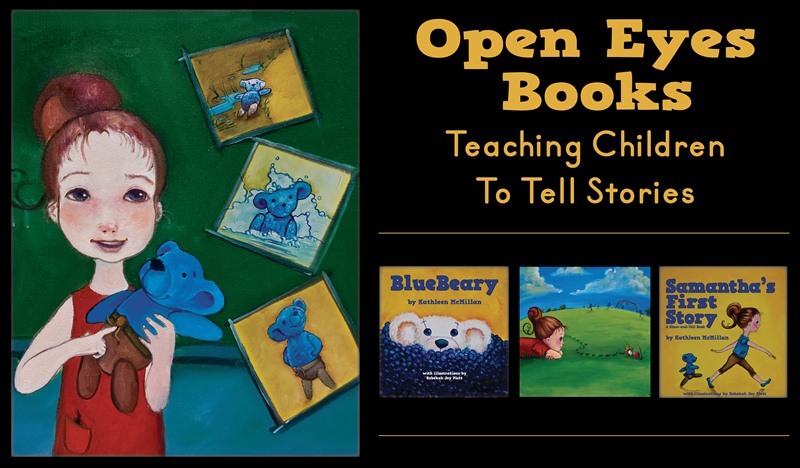 BlueBeary introduces the main characters in Open Eyes: A Series of Books for Children. At an early age children often develop strong attachments to a special blanket or stuffed toy. As growing children transition from the world of home to the broader world of school, they add other places of belonging and special friends like BlueBeary who are along for the ride. At every stage, these elements of a child’s world will take on new meanings. When seen through the eyes of a young child, the world is full of new things to explore and understand. As parents and teachers our work is to prepare our children to observe and understand their world as it expands, helping them learn to communicate their experiences. A young child whose eyes have been opened and who has been given words to use is now able to engage in the Great Conversation. Observation is nutrition for growing healthy conversations. Still, in order to observe one must set out and explore the world. There are times we should allow the juices of discovery to dribble down our chins. Once we taste the world, it changes us forever. BlueBeary and Samantha have begun that journey into an ever-expanding world. Through a partnership of home and school they are learning to see, to know, and to communicate. I invite you to join them in Open Eyes: A Series of Books for Children, as they search for show-and-tell items to share each month throughout the school year. *Note: Western philosophical tradition suggests that human interaction about ideas is like a great conversation extending through the ages from generation to generation. My ideas about “the Great Conversation” are heavily influenced by Mortimer J. Adler, Dorothy Sayers, and Susan Wise Bauer. Everyone has a story to tell. We all have events in our lives that make us who we are. Like BlueBeary, we go out into the world and experience things that change us. Often we are changed in small yet significant ways and it is important to learn how to share those stories. Learning to recognize the important elements of a story and to tell it clearly is one of the goals of Open Eyes Books and, in particular, of the Show-and-Tell series. This series of ten books uses a child’s classroom experience of Show-and-Tell to teach observation and communication skills through storytelling, preparing children to join the Great Conversation. * Show-and-Tell is a simple and fun way for parents and teachers to encourage children to share their life experiences. When I speak to older children, many of them fondly remember participating in Show-and-Tell during their primary years. Show-and-Tell is memorable partly because it is among a child’s first opportunities to participate in public speaking, and partly there is a storyteller in each of us waiting for a chance to speak. To prepare for Show-and-Tell at home we can take the time to listen to each other’s stories. Children love to hear about when Grandma was a girl or when Daddy was a boy. Begin early to share your experiences with the children in your life and ask them to share their own stories too. When adults and children discuss who, what, when, where, why and how questions about experiences and keepsakes, the thought process involved becomes natural to the children’s critical thinking and communication skills. Such discussions increase vocabulary and encourage the reflective aspects of thought and speech. They also strengthen relationship bonds as adults and children discuss the things they share. In BlueBeary, Samantha and BlueBeary recognize that their first and favorite place of belonging is together at home. Samantha begins at home observing her world and finding her story, starting to find her place in the Great Conversation. Through telling BlueBeary’s story for Show-and-Tell she recognizes another place of belonging in her life: among her classmates. As Samantha grows, her world will expand, she will find more people to share with and more things to share. With guidance, she will expand her vocabulary and her level of comfort talking to others, and she will recognize the important elements of her story, like family, friends, places and events. My hope is that each person who reads my books and uses the discussion guides will find his or her voice in the Great Conversation. Thank you for helping children participate in that conversation.